If you like the Opera Browser so much that you’d like to be able to take it anywhere you go, we’ve got great news for you – All you need to do is install Opera Portable onto your Windows system, save it to a USB drive, and you can! You’ll never have to deal with using the preinstalled public computer browsers like Internet Explorer ever again. - Tabbed browsing so that you can multitask. - Blocks all of those annoying popups that you sometimes have to deal with on other browsers. - Integrates the search engines. - The ability to customize the browser to suit your needs and/or personality. - Comes equipped with Opera’s email program. - Doesn’t affect any other browser installed on the system you’re using. 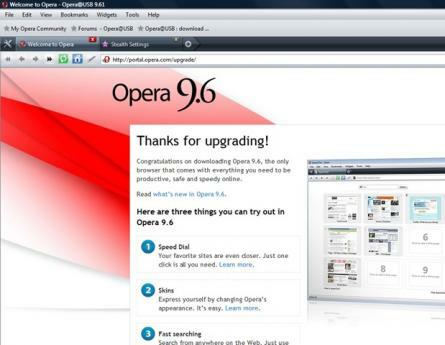 - Doesn’t affect any other versions of Opera that are installed on the system that you’re using. - Doesn’t make any entries on the registry. - Doesn’t leave any data on the computer that you’re using. - Protects you against websites that try to steal information from you. - Lets you set site preferences. - Has widgets to make your browsing experience fun. - Previews your various tabs in thumbnail form so that you can remember exactly what you have open. - A USB stick or flash drive with about 8 MB of free space.